Brother Bernard Knapke grew up in Saint Henry, Ohio, where he and his family of five attended a parish of the same name. He later attended the University of Cincinnati where he majored in mechanical engineering and earned a B.S. and M.B.A. in 2012. 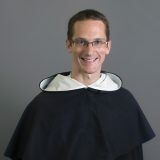 Immediately after college, he moved to Chicago for priestly formation and earned a degree in philosophy at Saint Xavier University in the spring of 2015. “As my desire to know Jesus Christ and my thirst for truth intensified during those initial discernment years, I discovered a religious order whose entire existence, for centuries, has hinged on prayer and study directed towards preaching and the salvation of souls. After meeting the friars for the first time, I felt certain that my personal vocation was bound up with the work of these sons of St. Dominic”.